Right. Does that actually make a difference to my point though? NEStris has been broken (in TAS terms) for a while now, I don't think a new faster TAS is going to come out of this new information. Muf has a point, the game is open to luck manipulation. But Qlex is also right, it all comes down to frame delays. The sort of results I'm talking about are biases that exist assuming no luck manipulation. It describes the natural tendency of the game and is only useful for legit players. TASers have been using this knowledge for quite some time now. But even if they knew how this worked, there is new knowledge here in describing the natural bias of the algorithm. I'm still working out NES randomizer stuff but I think I have some interesting partial results to share. Try a little experiment! You will never, not once, receive TT, JJ, or ZZ duplicate sequences. It's impossible. This specific test is easy to set up, but really it happens on an 8 piece cycle. So you can examine pieces 9-12 and find the same thing etc. There are other patterns with other pieces, it'll be really interesting to see how this settles. I think it fits the pattern described at the top of page 9 pretty well. T, O and S being "high probability"
I, J and Z being "medium probability"
as the 3 categories for people to keep in mind when playing. Nice to see it reflected in real data, nice job daleb! Daleb, could you point me to the script you talked about? I want to add more pieces to the script, and present the info with larger numbers. These scripts should count pieces dealt using vba-rr (google). It's not perfect but it does the job. I know I said there were 2 bugs, but they kind of cancel each other out when they both happen. So the most succinct way of stating them is to combine them together. 2. A reroll happened during the choice of that piece. 3. Excluding the first piece of the game, and including this chosen piece, you have received at least one of each of the 7 piece types. Then the roll that chose that most droughted piece will not update the bag of 35 pieces. Correct me if I'm wrong but if the chosen piece is the same as the most droughted piece, would it not have the same effect wether it updated it or not? They are the same piece, so the end result is the same. Sorry for the delay, been afk for most of the last month. When the chosen piece is the most droughted piece, what *should* happen is that a new most droughted piece gets calculated and that new piece gets inserted into the bag slot that the chosen piece came from. Instead there is no change to the bag of 35, which is a bug. simonlc, xyrnq and Kitaru like this. I've slowly been reading over all of this thread and trying to take it all in. To clarify further what CT last posted, the piece that is being placed into the bag should be calculated after the piece that is chosen is calculated. Instead what is happening is the piece that is being placed into the bag is being calculated before the piece that is chosen, so you can end up putting into the bag a piece that has a 0 drought. Is this correct? I forget the specifics of the implementation but you could be right. The location receiving the 0 droughted piece already contains that piece so it doesn't do anything. So I may have simplified what was happening in my notes. Each roll replaces the rolled bag index with a copy of the most droughted piece. This all happens as things are getting rolled, as opposed to all at once after the final roll. So if the final roll selects the most droughted piece, and assuming the above mentioned bug is not happening, then the last roll injects a "new" most droughted piece whereas all previous rolls injected the "old" most droughted (and selected) piece. 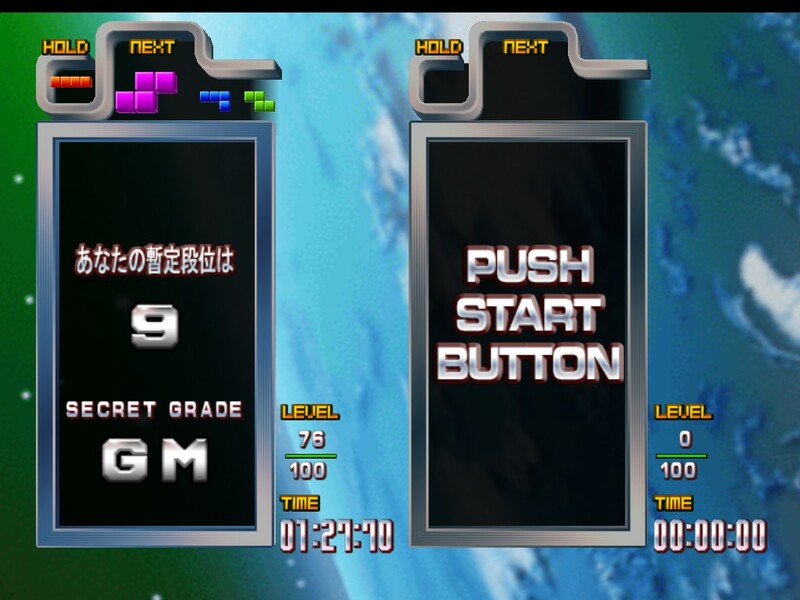 I did some looking into the TGM PRNG and TAP's piece sequences. As far as I can tell there is one master sequence of pieces, which has period 766,809,472 (in TGM1, the master sequence should be longer, in Ti not sure). The sequences you get when you play the game (starting at ZSSZ history) will converge on the master sequence after a small number of pieces. It can be exactly zero (seed's sequence is just a starting point in the master sequence), which seems to be the case for a million or two seeds. I don't know an upper bound yet because I've been trying to work on other things, but I'm guessing it takes no more than 30 pieces for any seed to converge on the master sequence. After 2^32 rand() calls the sequence loops. Simple stuff but I haven't seen a lot of TGM specific PRNG discussion so I'm just putting it out there. colour_thief, d4nin3u, Jayce and 1 other person like this. That's a really interesting analysts Fev. 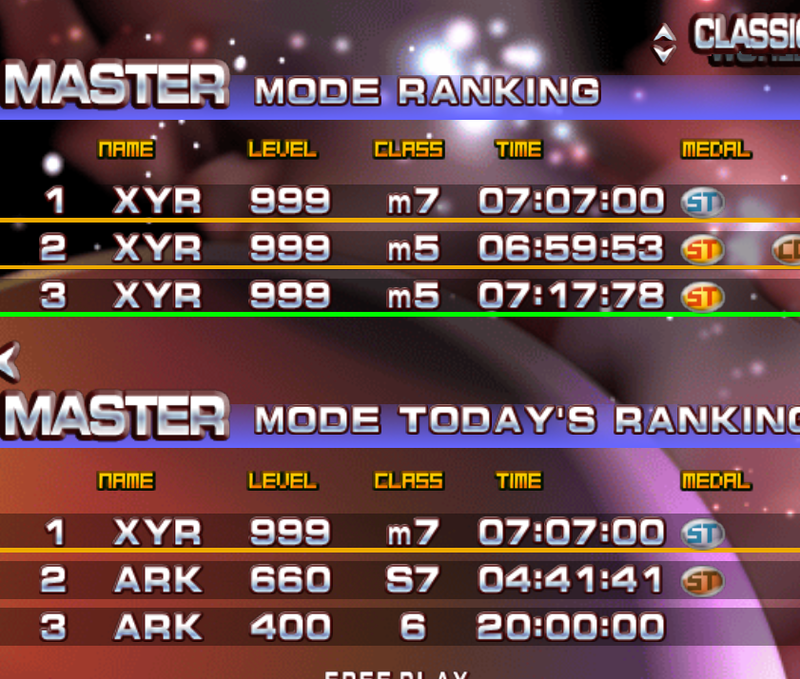 I'm curious if TGM3 has all seeds converging on a master sequence. Because the contents of the bag of 35 are always changing, the period might be crazy huge. For sure let us know about an upper bound for convergence if you find one! Note the code executed when a == lastPiece: firstly, lastPiece isn't updated, and secondly, nextPiece is set equal to rerollCount. This code will be executed 1/7 of the time, and since the value 1 corresponds to the piece T this largely explains where the bias comes from. Could someone confirm that I'm reading the assembly correctly? Qlex, Kitaru, colour_thief and 1 other person like this. @Arcorann I double checked your work and it looks accurate. A small thing I noticed is that when the reroll counter hits 5, it actually jumps slightly further back in the code and increments the piece counter a second time. This is an extremely pedantic correction though, because I just played 500 lines and never triggered my breakpoint even once. 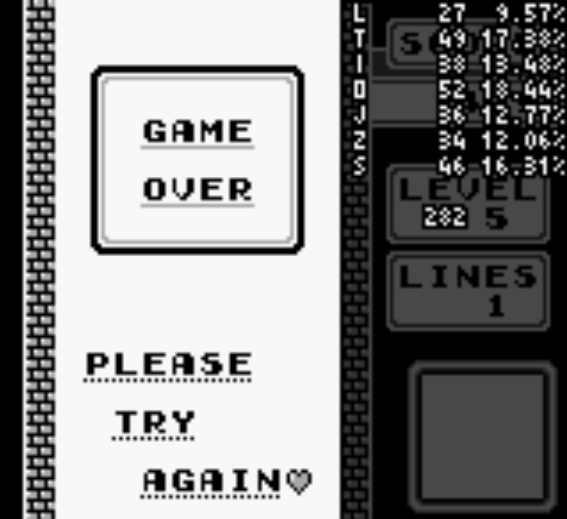 I believe that if you maxed out the line counter (assuming that's 9999) you would expect to trigger this only once. Ain't nobody got time for that. Another super minor correction is in the interpretation of expecting to branch on a == lastPiece 1/7 of the time. We know that 2 consecutive pieces determined by the piece counter are guaranteed to be different. So it's probably a bit worse than 1/7, something like 63/64 * 1/7 give or take weirdness in the DIV register. I swear the odds are even worse than that measuring it empirically. This means that while T is still massively biased, to a lesser extent we should expect to see it with Z (and S and J but not I L O) if we looked at the stats of a long enough sequence. Also because of the piece counter pieces, there are 7 piece pairs that are more common (similar to the a == lastPiece branching argument above). We would expect stuff like O -> I to be more common than I -> O even though both I and O are equally likely individually. Qlex, Echo, Kitaru and 1 other person like this. Thanks for the corrections. I'm almost certain they screwed up the rerollCount comparison, because if you make it the other way round the code makes a lot more sense (though not perfect sense), morphing into a slightly biased 5-reroll randomiser. I haven't formally analysed a long sequence but I did notice some of those correlations in the short sequence I posted. Too lazy to add the sakura stuff though. Arcorann, Qlex, d4nin3u and 1 other person like this. I'm just skimming thru this thread again, but based on some of the true random piece distributions I saw, I've ballparked it at about 5-6 I block droughts expected in a given maxout run on NES Tetris. Does that sound right? The number you would expect (and also the variance, which I don't have a sense of) is relevant to optimal stacking methods.